On Sale Now! 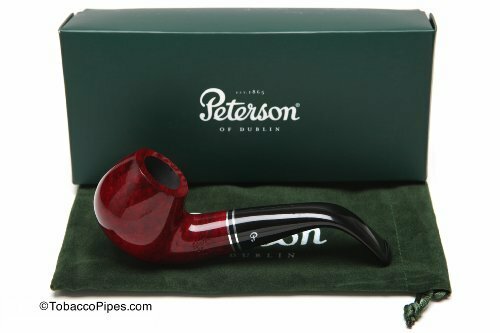 Save 5% on the Peterson Killarney Red 03 Tobacco Pipe Fishtail by Peterson at Serious Jones. MPN: Killarney Red 03 Fishtail. Hurry! Limited time offer. Offer valid only while supplies last. Brand: Peterson Model: Killarney Red Style: 03 Shape: Bent Apple Length: 5.20 in. / 132.07 mm. Height: 1.54 in. / 38.99 mm. Weight: 1.5 oz. / 43 g.
Brand: Peterson Model: Killarney Red Style: 03 Shape: Bent Apple Length: 5.20 in. / 132.07 mm. Height: 1.54 in. / 38.99 mm. Weight: 1.5 oz. / 43 g. Bowl Depth: 1.19 in. / 30.13 mm. Bowl Outside Diameter: 1.58 in. / 40.01 mm. Bowl Inside Diameter: 0.74 in. / 18.74 mm. Filter: None Finish: Smooth Bowl Material: Briar Stem Material: Vulcanite Package: Box Country: Ireland Bit: Fishtail Band: Nickel *Pipe measurements are approximate **Pipe pictures are not of actual pipe you may receive.